Who will receive the new trash containers? Residential garbage customers of the City of Spirit Lake, in residential areas. If a multi-family complex is using a dumpster, it will continue to use a dumpster. When will I receive my trash container and how much will it cost? 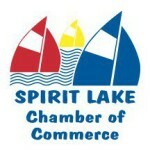 Containers are being delivered during the week of May 29 and are free of charge, but are the property of the City of Spirit Lake. When may I start using my new trash container? Commencing the week of June 4, on your regular garbage pickup day. Carts need to be out no later than 7 a.m. on your regular garbage pickup day, and may be placed out the night before. Where do I place my container? At the curb or the end of the driveway, but not in the street. The automated arm on the new truck needs room to “grab” the container, so the container must not be placed adjacent to or behind a parked car, or next to a utility pole or sign. Will the sanitation department follow the same routes? Although your pickup day is the same, the truck picks up one side of a street at a time and will travel a route that minimizes the number of times it has to turn around. As a result, you may see your neighbor’s trash across the street collected and it could be an hour or two before you see the truck come back down your side of the street and collect yours. Again, your pickup day is the same, but the time of collection will vary, so it is essential your cart be out no later than 7:00 a.m.
What may be placed in the container? Any garbage that you would have been able to place in your green bag, those rules have not changed. A list of instructions and suggestions is included with the hard card from Schaefer that will be delivered with your container. What if I did not receive a container? Container delivery will be completed by Friday, June 1. If you have not received a container by then and feel you should have received one, please call City Hall at 336-1871.